Looking for a meaningful way to display your devotion in your daily look? 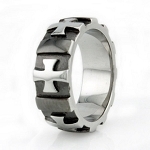 Look no further than our 6mm satin-finished men’s titanium ring with a single cross and beveled edges. Each time you look down at this ring, you will be reminded of the ultimate sacrifice that Christ made for all of mankind. This ring provides the best of both faith and fashion in one sleek and sophisticated package. Best of all, titanium is a resilient alternative to platinum, palladium, or other metals. Titanium offers a superior resistance to corrosion, denting, discoloration, and tarnishing. We accentuated the natural beauty of titanium by finishing this ring with a satin texture. 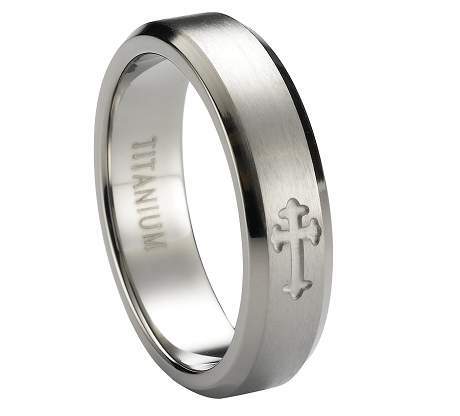 Show off your faith at the forefront of any ensemble by choosing our satin-finished men’s titanium ring with a single cross and beveled edges. If your accessory collection needs some divine intervention, our 6mm satin-finished men’s titanium ring with a single cross and beveled edges just may be the solution you need. The 6mm band is the perfect width for men who might not be accustomed to wearing jewelry every day. Plus, the polished edges frame the satin-finished center to provide a two-toned effect. We designed each satin-finished men’s titanium ring with a single cross and beveled edges in the comfort-fit style to suit large knuckles. Comfort-fit rings are very comfortable to wear and can be easily removed. If you have any questions about this item or need help with your order, please contact JustMensRings.com today. Love this ring! We bought another one once we got it, so that we would have matching rings. 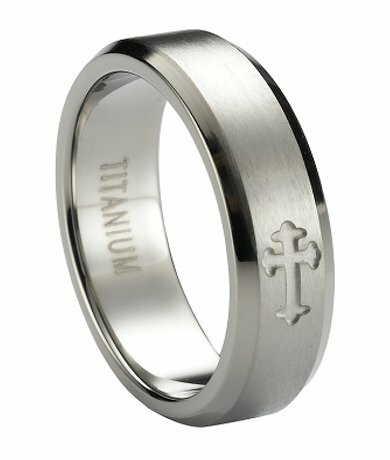 I ordered the Satin-Finished Men's Titanium Ring with Single Cross and Beveled Edges | 6mm - JT0180. I originally ordered size 11, when it arrived I thought it was very simple and nice. The size was too small, I sent it back with my $4 check and within 10 days I had my new ring. I was very pleased with the ring and return policy. As a customer I always enjoy when I don't need to pick up a phone to get the customer service I feel is deserved. 5 Star website for my experience. shipped quickly and very good quality and not big and bulky but not a super small ring either. Very nice.